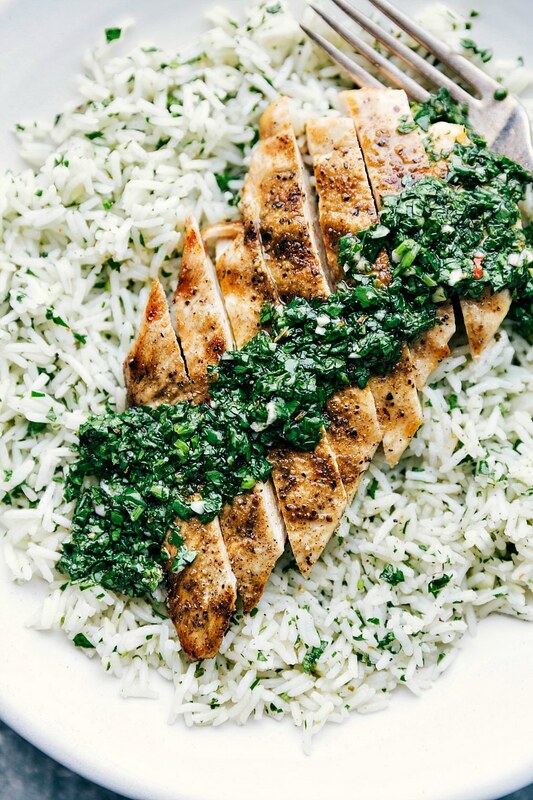 One of our favorite healthy and easy dinner recipes: chimichurri chicken! 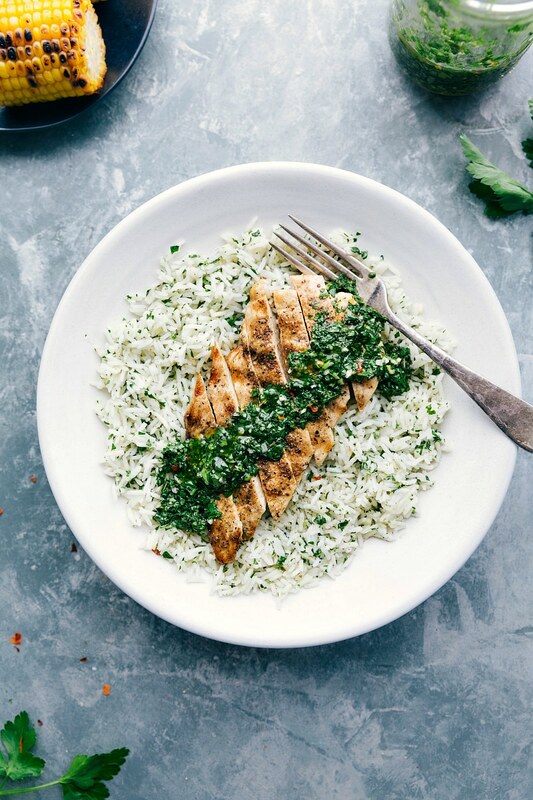 An addictive green herb sauce drizzled over simple spice-rubbed chicken breasts (or thighs) makes for a flavor packed meal. We love pairing this delicious chimichurri chicken with this light and refreshing cucumber salad, easy bruschetta, or roasted carrots. If you’ve been reading my blog for any length of time, it’s probably no surprise to you how much I like sauces. I think they add so much flavor and complexity to dishes! And nothing beats a sauce that’s homemade. 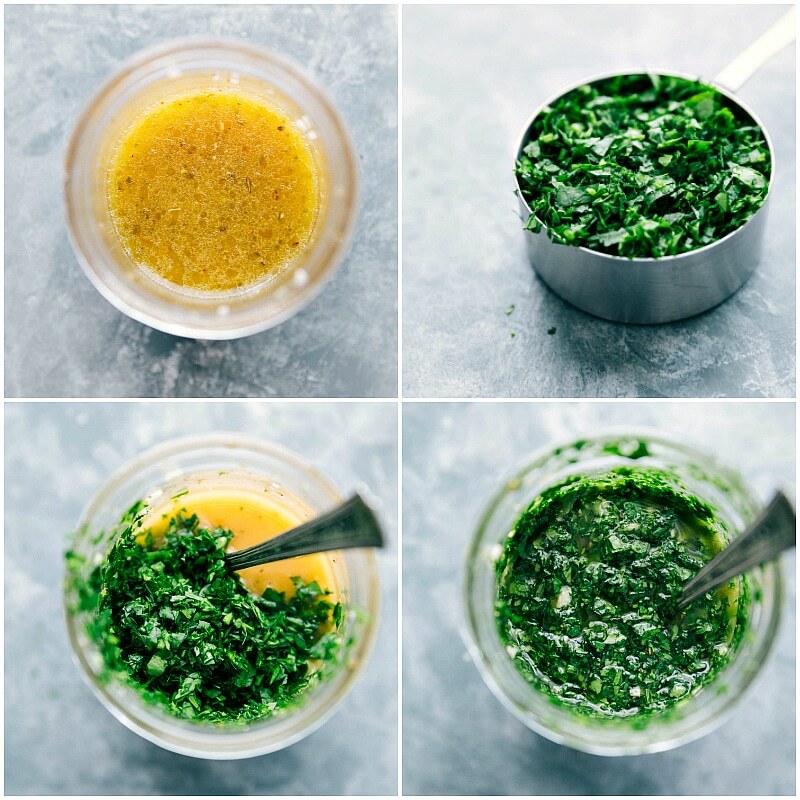 This chimichurri sauce is no exception to my love of sauces! While it’s not 100% authentic to argentina chimichurri, it’s my favorite take on the famous herb sauce. If you aren’t familiar with chimichurri it’s an uncooked sauce that’s typically paired with grilled meat (often as a marinade and/or sauce). Chimichurri sauce originated in Argentina & Uruguay and comes in green and red versions. Typically the sauce is made from finely chopped parsley, minced garlic, olive oil, oregano, and red wine vinegar. The dominate flavors are usually parsley and garlic. This chimichurri has a few more flavors added: cilantro, lime juice, and a little bit of honey to balance the acidity out. Chimichurri is a great marinade for meats, veggies, or tofu. To use as a marinade combine the following: 1/4 cup chimichurri, 1/2 cup olive oil, 3 tablespoons red wine vinegar, and a hearty pinch of salt. Stir together and add to your protein, veggies, or tofu. You can use this marinade recipe for this chimichurri chicken, but it’s completely optional. The 4-ingredient rub adds a lot of flavor to the chicken. Add all the ingredients EXCEPT the parsley, cilantro, and olive oil to a food processor; use a mini prep processor if possible. I use and love this one. Pulse to chop — you want ingredients pretty finely minced here. Add herbs — again pulse to chop, but this time you want the herbs to be a little more coarse (they’ll soften as they sit). Drizzle in oil — while the processor is running, drizzle in the oil to help thicken the sauce and chop the herbs a little more. Again you don’t want this sauce to be smooth as it’s best with texture. Make the chimichurri ahead of time: if you’re planning meals for the week (or meal prepping), I recommend making the sauce a day or two ahead. You might even want to double it and add it to whatever else you’re eating during the week (see ideas above). This herb sauce just gets more and more flavorful as it sits! Adjust red pepper flakes: if you don’t like any heat to the sauce, leave them out. On the flip side, add more red pepper flakes for additional heat. You can use the chimichurri sauce straight from the mason jar, but it improves in flavor after it sits for an hour at room temperature or overnight in the fridge. It is generally served at room temperature. Chimichurri lasts 5-7 days in an airtight container in the fridge. Good news here — you can freeze this sauce! Pour leftover chimichurri into an ice cube tray and freeze (tightly covered) until solid. Transfer cubes to an airtight bag or container. It will keep in the fridge for approximately 3 months without losing flavor. Thaw overnight in the fridge. CHIMICHURRI SAUCE: In a large mason jar (Note 1), add the finely chopped garlic cloves (2-3 cloves if sensitive to garlic, or 4 cloves for garlic lover! ), red wine vinegar and freshly squeezed lime juice. Stir and set aside. 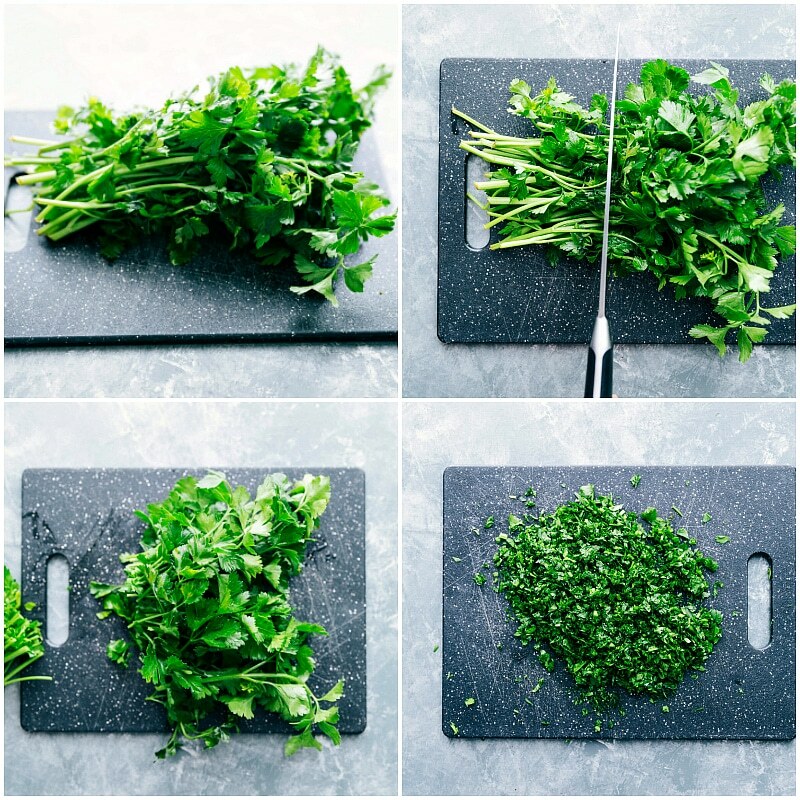 Finely chop a bunch of parsley to get a full 1/2 cup (you should use most if not all of a good sized bunch; some stems are fine -- I just chop off the bulk of large stems and then chop the rest). Finely chop the cilantro and measure to get 1/2 cup. Back to the mason jar, add in the olive oil, dried oregano, red pepper flakes, and honey. Place the lid on the jar and shake to combine. Add the 1/2 cup finely chopped parsley and cilantro to the jar and stir to combine. Season to taste with salt and pepper (I use 1/2 teaspoon salt and 1/4 teaspoon pepper). Place the lid on the jar and place in the fridge overnight or let stand at room temperature while preparing everything else. CHICKEN: Preheat a grill or grill pan to medium-high heat (about 400 degrees F.) (Note 2) Generously oil the grill or ridges of grill pan (I drench a rolled-up paper towel in vegetable oil and, holding it with tongs, rub it over the grill grates.) Remove excess fat from the chicken breasts. Slice the breasts in half horizontally, cover with plastic wrap (avoid splatter), and pound halves to an even thickness using a meat mallet or the bottom of your frying pan (this helps them cook evenly). Using a pastry brush, brush olive oil over all sides of chicken. In a small bowl whisk together cumin, coriander, 2 teaspoons salt and 1 teaspoon pepper (or add salt/pepper to taste; if not using kosher salt (and using table salt) you'll need to reduce the amount of salt.) Sprinkle this seasoning mix over all sides of the chicken. Press in but don't rub into the chicken. COOK: Place the halved and pounded chicken onto the grill or grill pan and cook for 5 to 6 minutes per side, until the chicken is cooked through (registers 165 degrees F on a food thermometer and juices run clear). Remove the chicken from the grill/grill pan and let rest for 5 minutes, tented with foil. Slice chicken against the grain. ASSEMBLE: If desired, serve cooked chicken over grain of choice. We like white rice or couscous best! I like to stir about 1/3 cup chimichurri into the cooked grain. Add chicken on top and spoon generous amounts of chimichurri over top. For storing leftover chimichurri see directions in blog post. Note 2: You can also use a regular pan! Heat 1 tablespoon oil in a sauté pan over medium-high heat. Add (horizontally halved) chicken breast and cook for 4-6 minutes per side until the chicken is cooked through and the juices run clear. Transfer the chicken to a clean plate, and loosely cover with foil. Let the chicken rest for 5-10 minutes. Slice against grain. Another chicken recipe. My next assignment is to cook this recipe. I love the way it cooks. It is easy to prepare. I will think some ingredients to add to make it tastier and delicious. Thank you.